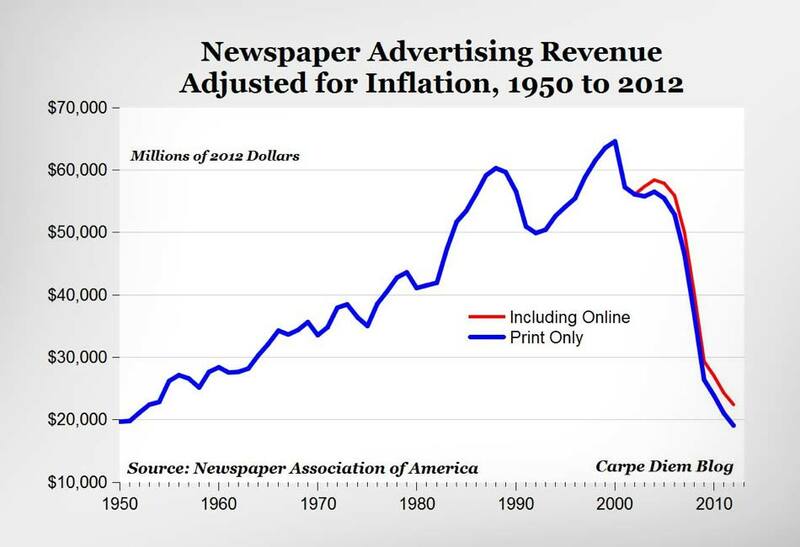 2014 looks to be a very interesting year for the future of news, unlike 2013 which I would call the great depression. If you have followed the behavior of the newspaper industry over the past five years, you will have noticed the very tell-tale signs of shock. Five years ago, the industry suddenly realized how bad a situation they were actually in. We all remember this graph, which illustrates the problem in the clearest way possible. This dramatic change in the market caused the industry to go into shock. First, newspapers hunkered down hoping that they could weather the storm, so to speak. When that didn't work they started cutting costs and laying off people. This turned shock into desperation, and newspaper people started screaming that something had to be done. At first this seemed like a positive thing. In 2010 and 2011, the newspaper world was filled with conferences at which people were talking about change, coming up with ideas, and challenging the status quo. Of course, most of these ideas were utter nonsense, but there was a drive for change. But the industry couldn't escape the relentless focus on cutting costs. And you can't cut costs, which forces a short term focus, and have a desire for big changes. To change something, you first need a willingness to invest. Not just in the next six months, but in fundamental changes over the next 10 years.